It’s not clear at this point whether this will be a completely new product (one guess from TNW is a new home for Project Avalon), to compete against the likes of VMWare, Amazon, Oracle and Salesforce. On the other hand, it could simply be a relaunch of the services that existed at Cloud.com before the old page was taken down. The change was first brought to our attention by Fusible, which had a screenshot of how the page looked last week. As you can see, it had links to different products, news and events, partners and customer case studies. As we noted when Citrix bought Cloud.com, some of the big names that had signed up to the platform included games giant Zynga and Tata. Meanwhile, the Twitter account for Cloud.com, @CloudDotCom, has been inactive since April of this year. One of the spinoff products, CloudStack, has its own, active Twitter account and separate website, but that is also undergoing a change: as of yesterday, it started to redirect to an Apache Incubator page, part of Citrix’s move to donate the project to the Apache Software Foundation, also home to Hadoop. 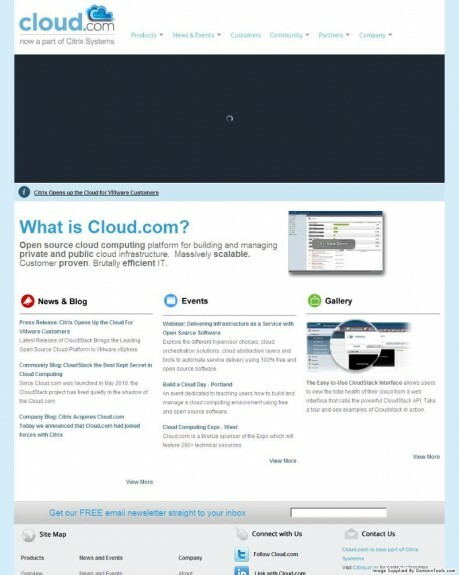 The old CloudStack site is now housed at Buildacloud.org. We have reached out to Citrix for comment and will update this post as we learn more.